Blepharoplasty, also known as eyelid surgery, is a surgical procedure that corrects eyelids that are sagging or drooping. Because the skin of the eyelid is thinner than other areas of the face, it tends to show the first signs of aging. Eyelids that sag or droop can affect your peripheral vision and make daily activities more difficult. A blepharoplasty will remove excess skin and fat and tighten the muscles and tissues of the eyelid. It eliminates the skin that is drooping into the visual field and improves peripheral vision. There are two types of blepharoplasty: functional and cosmetic. Functional Blepharoplasty: A functional blepharoplasty removes the excess skin that obscures your field of vision. If the procedure is determined to be medically necessary, it may be covered by medical insurance. How much vision is affected will be determined by testing your visual field with a Humphrey Visual Field (HVF) Analyzer. Cosmetic Blepharoplasty: A cosmetic blepharoplasty can be performed on either the upper or lower eyelid, or on both. Depending on the type of lower eyelid blepharoplasty, either excess skin in the lower eyelid is removed or a redistribution or removal of excess fat is performed. You should have realistic expectations before undergoing a blepharoplasty. While the procedure can improve the appearance of your eyelids, it does not dramatically alter your face. If you are considering a blepharoplasty, you should be in good overall health, not smoke, not have any serious eye conditions, and have facial tissue and muscle that is healthy. Blepharoplasty is typically performed in an outpatient setting and requires local anesthesia and sedation. The procedure can take anywhere from 45 minutes to 2 hours, depending on whether you are having the procedure on both the upper and lower eyelids. If your upper eyelids are being operated on, the incision lines are typically made along the natural crease lines of your eyelids. Once the incisions have been made, fat deposits are repositioned or removed, muscles and tissue are tightened, and excess skin is removed. If you have surgery for the lower eyelids, an incision may be made either just below the lower lash line or on the inside of the lower eyelid. Depending on the method, excess skin in the lower eyelid is removed or fat is redistributed or removed. After the procedure, your incisions are closed with either removable sutures, skin adhesives, or surgical tape. After a blepharoplasty, your eyelids may be covered with gauze and a lubricating ointment and cold compresses may be applied. You will be given specific instructions to follow including the medications you should apply or take orally and a date and time when you should see your surgeon for a follow-up examination. Your doctor will also let you know of any symptoms or signs you should watch for that would mean you should follow up sooner. You can expect to experience some swelling, bruising, irritation or dry eyes. Most of the swelling subsides within two weeks. You will not be able to wear contact lenses or eye makeup for two weeks after surgery. Your stitches will usually be removed by the third or fourth day after surgery. It may be recommended that you wear dark sunglasses for the next two weeks to protect your eyes from sun and wind. You can return to work in a few days to a week but will need to avoid exercise and strenuous activities for at least two weeks. A blepharoplasty is usually very well tolerated. After the surgery, there may be swelling and bruising around the surgical site. This will eventually subside on its own. 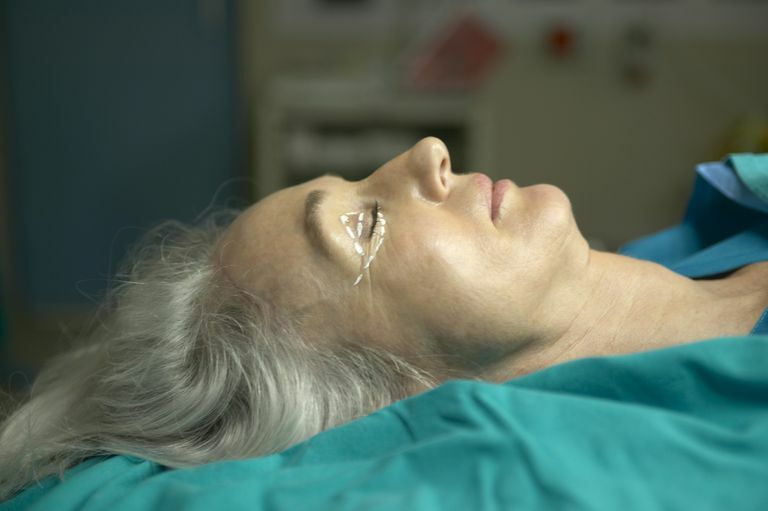 Complications are not common but may include infection, a granuloma, reaction to anesthesia, and double or blurred vision. Your eyes may experience some irritation and dryness due to a temporary change in tear distribution. Your scars from a blepharoplasty will usually be well-concealed and fade with time. Make sure to talk to your doctor about any concerns she may have related to your specific symptoms as well as any possible complications which may occur. Drolet, B., and P. Sullivan. Evidence-Based Medicine: Blepharoplasty. Plastic and Reconstructive Surgery. 2014. 133(5):1195-205. Karimnejad, K., and S. Walen. Complications in Eyelid Surgery. Facial and Plastic Surgery Clinics of North American. 2016. 24(2):193-203.